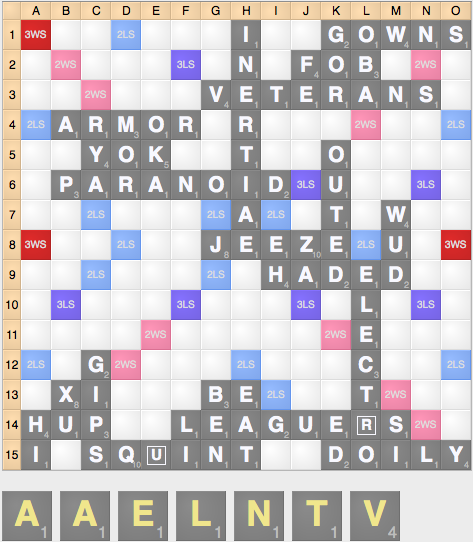 One popular sentiment among tournament Scrabble players is that passing is always a bad play: that you are always better off exchanging or making a play whenever possible. As a general rule of thumb, this is definitely true: passing is very rarely the correct play, as it scores zero points and doesn’t improve your rack. Usually there is at least a tile that you can exchange, and if your tiles are not any good this rack, what makes you think they’ll be any good on a future rack. However, like any rule, there are exceptions. Make no mistake, these exceptions are rare, and for the most part, only high-level players should ever do this, since by and large, passing is generally a mistake and most players do it far too often. Even when done by top players, passing is less often an optimal play and more often a play that is hoping your opponent is going to make a mistake. Most of these exceptions come towards the end of the game, however, there are some rare times when passing is acceptable in other situations. This page will discuss the many appropriate applications of passing your turn, both. Before we start, it’s worth noting that the most frequent time to pass should actually be when a good opponent passes. Most of the time when your opponent passes, they are hoping you make a mistake: passing is seldom (although sometimes) optimal. If a very strong player passes, alarm bells should be ringing through your head, and something bizarre is going on. When in doubt, if someone passes, your first instinct if you don’t know what to do should be to pass (or exchange), and this way it’s unlikely you get exploited by your opponent. This holds true whenever a strong opponent does something that seems crazy: they’re almost always thinking *something*. It’s very rare that passes are optimal: more often they are actually gimmicks seeking to induce mistakes. Situation 1. 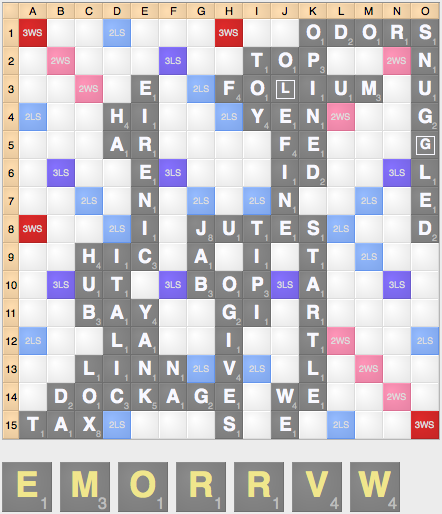 When you’re stuck with a tile, but your highest scoring options gives your opponent a better option. 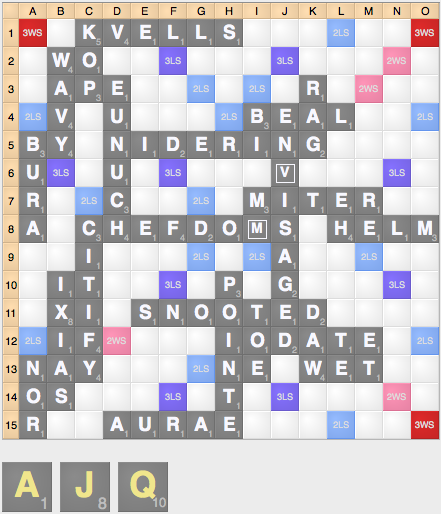 In this position, you have the word TAJ at 14h, but you can’t play it as it gives your opponent the word OOZING 15j for 87 points. However, if you pass, your opponent will give you this optiion and score elsewhere. Situation 2. When you’re stuck with a tile, but you need to thwart endgame setups. In this position, your remaining R and T can both limit or prevent opponent’s Z setups. While you’ll never score more than the 22 points from WHORT with those tiles, the defensive capacity of those tiles make passing a better option. 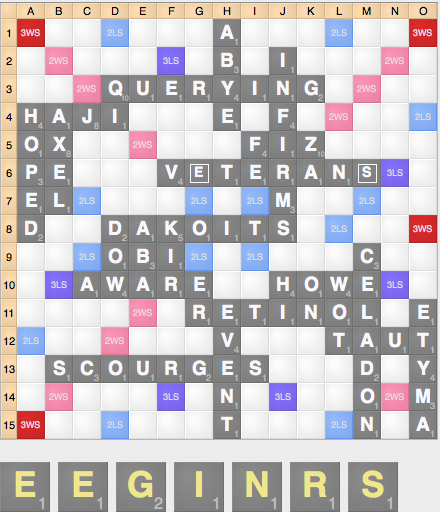 In this position, holding QIS on your rack severely limits your opponent’s options, making it a worthwhile keep as they can’t slow-play their tiles nearly as easily. You can always cash your I and S on future turns. Situation 1. When there’s an unplayable tile (usually the Q) that will likely swing the game. This is especially true when ahead: you want to make your opponent draw the problematic tile. 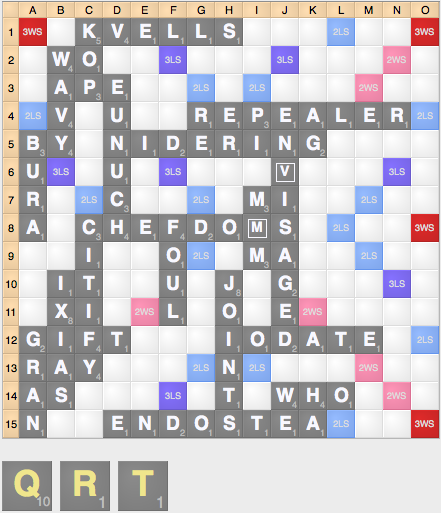 In this position, you want to pass as the only way you can lose is by drawing the Q. Once the Q threat is safe, you’ll be able to play an endgame and win by sticking your opponent with the Q. It doesn’t even matter if you have a bingo: you still need to pass in these sorts of circumstances. The additional 50 point bonus won’t save you from the consequences of playing a trap endgame with the Q.
It’s worth noting that if you’re the opponent, if your opponent is passing in these circumstances, you will usually be better off on spread by passing back. This should lead to an occasional game where the bag is never emptied, and the game will simply end on 6-passes. However, be careful, as a particularly tricky opponent might start passing with the Q in hand. Situation 2. When the score is such that you need your opponent to empty the bag. In this position, you only have bingos to the C: scoring minimally and allowing your opponent to bingo out and score enough to win. However, any opponent’s bingo on their next play allows you to bingo and win. Even if your opponent gets clever and tries to block the C and guess your rack (and realistically they can’t do that well) you should still be able to outscore your opponent. Situation 3. When your opponent is likely to empty the bag and almost never blocks your spot. 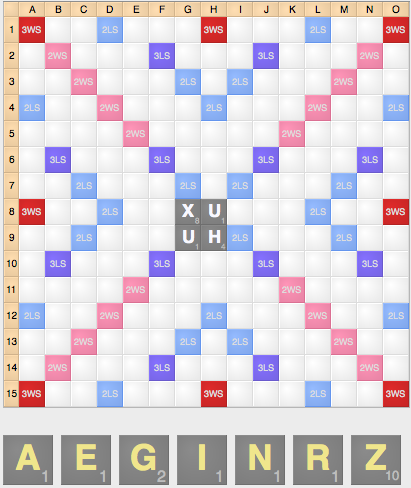 In this position, there’s very little chance that the I in row 1 is getting blocked, even if you pass, as doing so will score very few points and cripple your opponent’s rack. Meanwhile, playing a bingo immediately isn’t so great, as II draws or potential C sticks could lead you to lose a lot of spread. Thus, passing is viable, hoping your opponent plays so you can bingo out. It’s worth noting that your opponent could just pass back, but then you can always play the bingo later. It’s essentially a freeroll. Passing back is always a viable counter-strategy, but it doesn’t put your opponent at an advantage. 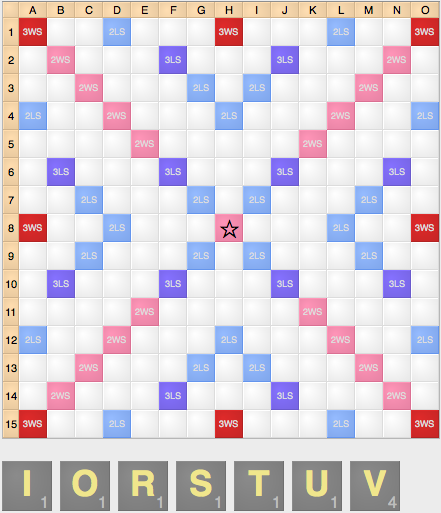 It’s also worth noting that your opponent can play off one tile, but that mitigates the II draws, makes C sticks less likely, and again, you still have the option to pass. Situation 4. When you think passing can induce mistakes. In this case, your opponent has the word WORMSEED regardless of what’s in the bag, as well as numerous other bingos. In short: you’re in a lot of trouble, and if your opponent plays perfectly you’re really only winning with the blank in the bag: hardly a good proposition. 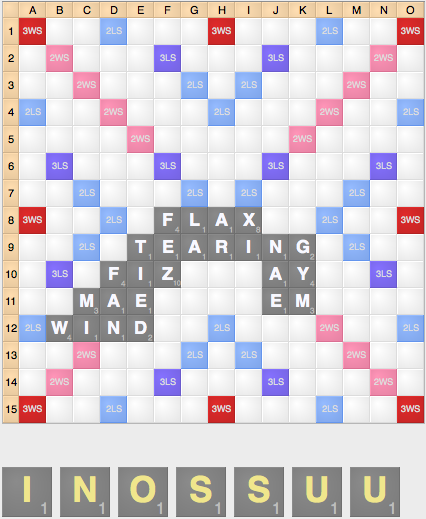 However, you might be able to bailing yourself out by passing, and trying to induce your opponent to make a mistake by playing WORMSEED immediately, or by making a blocking play or alternate bingo that also allows ANTEATER or allows you to block bingos. For instance, let’s say that your opponent has EMORSW?. The reality of the situation is that if your opponent is thinking, he or she will actually not play WORMSEeD, and in fact, probably be able to figure out your rack since it’s the only sane thing you can have in this position with a pool of AAEENRTT. They can use leave inference to thus figure out your ENTIRE rack after you pass, and thus react perfectly, and thus, they’ll come up with better options. Needless to say, this is a massive problem. Situation 5. When there’s one in the bag and your opponent has to empty it. In this case, you have a bingo in two spots, but you have to draw the last tile in the bag. 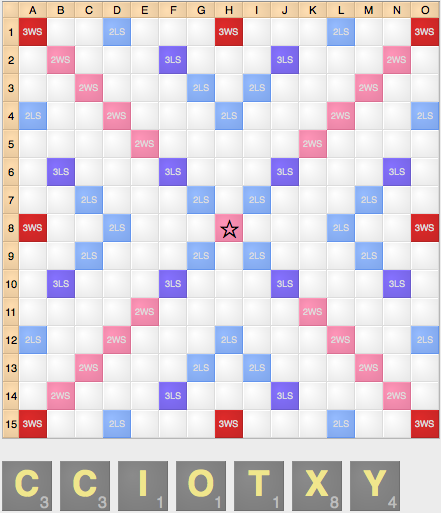 In this case, you can gain some spread by passing, letting your opponent play and drawing the last tile in the bag, then playing a bingo out. Your opponent can do little to nothing to prevent this tactic other than pass back, making this position another freeroll. Situation 6. To induce your opponent to open a 3×3 (can rarely occur mid-game). In this case, your options for a bingo are very bad, as your only option is 9s through the AR. While you can play a bingo, you’ll want to pass with a fair amount of racks here that have bingos with an S, and as a result you’ll also want to pass with some really strong racks. 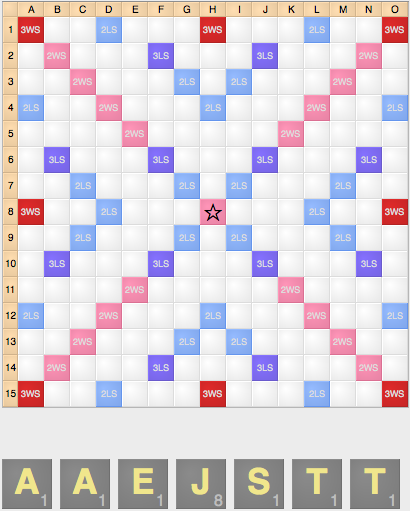 The reason for this is that your opponent should open some lines that don’t take S hooks: plays such as 4s from b12 so as to not give S racks bingos. As a response, you can use a rack like this to punish those types of plays and hit a 100+ point play next turn. Without keeping a rack like this to pass with from time to time, you’ll be unable to pass with S-bingo racks such as SILVERS since your opponent can simply exploit you by refusing to open an S lane. Situation 1. When you’re hoping to win the game via the 6-pass rule. Passing three times with a rack like this makes a lot of sense, as your opponent is somewhat likely to pass three times and end the game. Even if they only do so 30% of the time, this is still a net positive result for you. Situation 2. 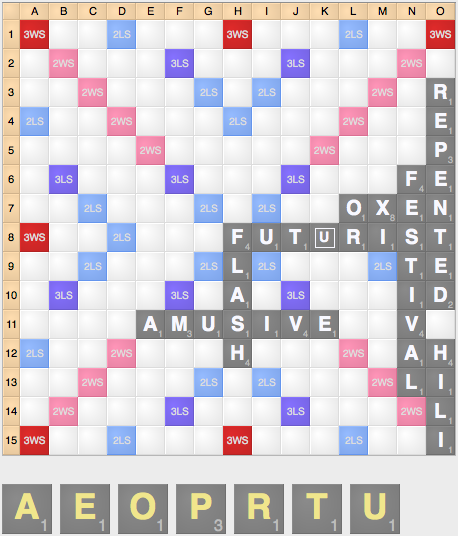 When you’re using the threat of the 6-pass rule to force your opponent to give you a tile for an 8 letter word. With this rack, you can potentially hit a huge score with either OXYTOCIC or EXOCYTIC for a HUGE score. Because of this and the lack of other scoring options, this is an extremely strong rack to pass with. 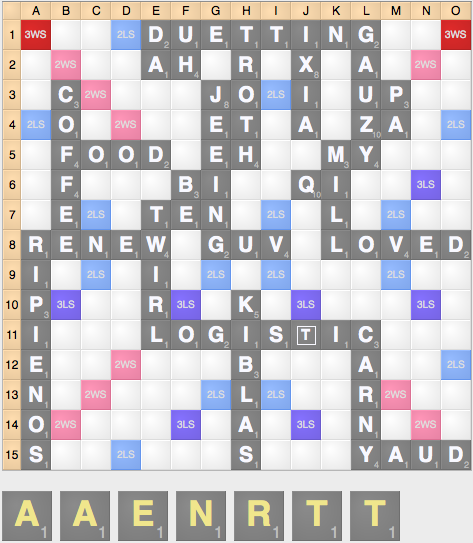 With this rack, you can play a bingo and hit the TWS with 4 of the vowels played on the center star with VIRTUOS(A/E/I/O) and bingo with the last one (VIRTUOUS) making it a strong candidate to pass with on the opening rack. It’s worth noting that with both of these racks, you need to be willing to go the distance and pass three times, risking a 6-pass loss. If you’re not willing to take that risk, you shouldn’t be passing in the first place. Because of this, you should pass extremely rarely with this type of rack. Let’s say that your opponent has passed, you’ve exchanged, your opponent has passed, and you exchanged again, and your opponent has passed for a third time and you have this rack. This is not a rack you want to pass with, or even exchange 1: it’s not a strong enough rack. 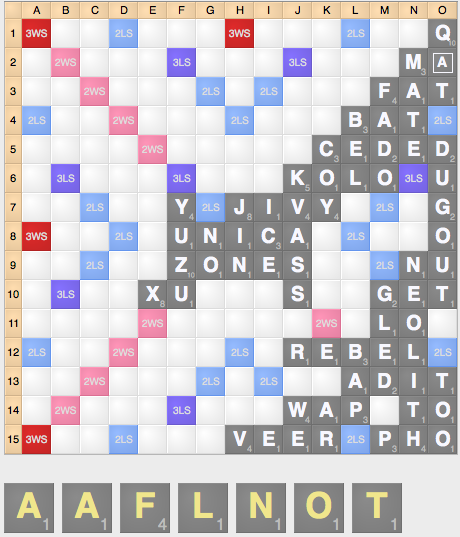 You probably want to play the word TAJ, however, your opponent is likely to use the A to play a bingo, often hitting the 3WS. Because of this, you actually don’t want to play TAJ at 8g like normal, but rather you want to open off center: playing TAJ at 8h to reduce the score of your opponent’s likely bingos. 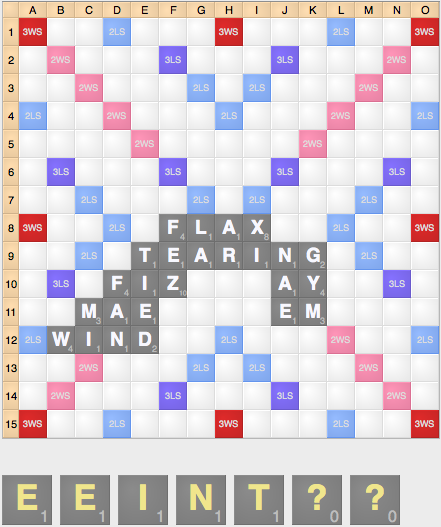 This is the best way to defend against opponents using a passing tactic, as it limits their ability to really punish you since they will primarily focus on vowels you might open to play a bingo. Situation 1. 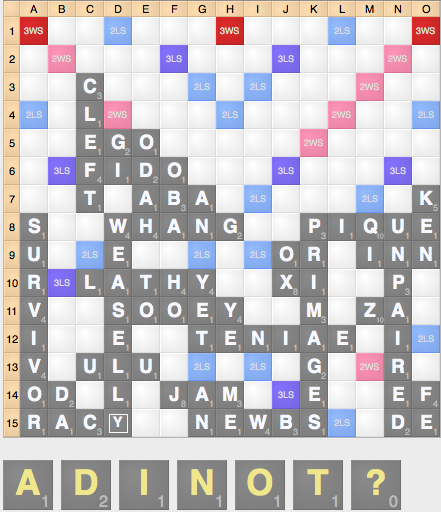 When you have a lead and most of your opponent’s plays will give you bingos that score significantly more than your best play. In your opponent’s shoes, even if they know you often have a rack like this, it’s very difficult for them to respond. Their best plan of action is to make short plays that don’t open bingo lanes, but that further shuts down the board. They can also exchange, but probably not at much benefit, especially with a rack after NAE. They can make longer plays and create potential bingo lines for 8s, but those plays are risky and don’t really help your opponent much in the long run even though it would work out in this instance. 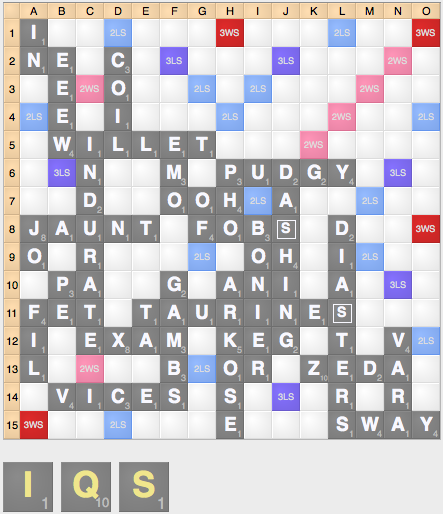 In this example, you’re ahead by 40 points, but your opponent has traded 5, likely with either the blank or the S. The board is extremely closed. While you can play something like FLOAT, you can also pass, as your opponent is extremely likely to play XI next turn, allowing you to play AFLATOXIN. While your opponent *might* be able to figure this out, it’s much more likely that a) they won’t see the possibility at all, or b) they think that you just have a bingo rack of some sort and hope you’ll open the board through them. This situation will happen about as often as winning the lottery. Situation 3. When your opponent has played a phoney. Situation 4. When the board is near gridlock and you’re ahead, you have no good plays, and you have no good tiles to exchange.